I've been reading Misbehaving: The Making of Behavioral Economics by Richard H. Thaler. A point of interest is the discussion of automatic enrollment in 401k plans. Automatic enrollment may get employees started saving for retirement. But 401k default options associated with this type of sign-up (such as an investment choice of a money market fund and a savings rate of 3%) may be unlikely to help employees achieve the outcomes needed for a comfortable retirement. So, what's the story about these default options? Employers may be interested in getting employees to contribute to the 401k plan for two reasons: they want to establish and maintain compliance with IRS regulations; and they genuinely want to prepare employees for retirement. The IRS gives tax advantages to 401k plans that can benefit employees and employers. For example, an employee can benefit through a reduction in taxable income in the year she makes contributions to a 401k account. But the 401k plan can maintain its tax-exempt status and related benefits only if certain conditions are met. One of these conditions relates to nondiscrimination requirements. Discrimination in this context means that highly compensated executives can't receive special treatment compared to nonhighly compensated employees. That is, contributions of regular employees must be proportional to those of execs. By adding an automatic enrollment feature (which must come with default options to implement the enrollment), employers may be able to satisfy IRS requirements and avoid tax consequences. Behavioral economists (aka “econs”) like Thaler study how and why people make economic decisions. They've pinpointed major obstacles to retirement planning: 1) inertia; 2) loss aversion; and 3) lack of self-control or being more present-biased. Without a feature like automatic enrollment, employees may not sign up for a 401k plan because doing nothing is easier than taking action. Investing carries a risk of loss so retirement investing doesn't sound appealing. In addition, many people prefer (or need) money in their paycheck to spend today instead of investments in a retirement account for the future. To encourage regular people to make decisions in their best (long term) interest, econs formulate, test, and suggest government and company policies. Automatic enrollment is an idea that solves the problem of overcoming inertia relating to retirement planning. With this feature, employees still can opt out of automatic enrollment but it's easier to do nothing and begin saving. One study showed that before automatic enrollment was introduced, just 49% of employees participated in a company 401k plan. After automatic enrollment, that percentage jumped to 86%. The problem with automatic enrollment surfaces because employers must specify 401k default options in which employees enroll. The main options relevant to new and current employees are the investment choice and savings rate. Employers may fear being too pushy or paternalistic with aggressive settings like company stock and high savings or contribution rates. In addition, according to Misbehaving, regulators initially approved just the money market fund as a default option, resulting in this investment choice as a common default. From an employers' perspective, simple settings make sense. But employees need to realize that default options may not be the best ones for them in the long term. In other words, contributing 3% of one's salary in a money market fund may not be enough. However, if the employee saves 10% and invests in a diversified portfolio of index funds earning (on average) 5% annually for 30 years, then he could retire with $665,000. With a 50% company match, the 401k account could grow to $996,000. Though a hundred thousand dollars is nice, that amount of money is unlikely to sustain a comfortable retirement lifestyle for long, unless the retired employee has other sources of income, like a pension or rental properties. Having a half-million dollars or nearly a million dollars would be better. On the bright side, some employers have introduced programs that increase the savings rate over time, such as a gradual increase over time or an increase synced with pay raises. From a personal perspective, I favor easy enrollment, even if it comes with so-so default options. Saving some is better than not at all. In addition, I've benefitted from paternalistic employers. One offered a great retirement program and another, excellent healthcare coverage and generous vacation benefits. In an odd twist, paternalism has allowed my family to live more freely than many others. However, I acknowledge that there can be a downside to employer actions. An employer could enroll its employees in a plan, make company stock as a default option, and charge exhorbitant fees. And even if the employer didn't take advantage of its employees, simply making 401k plan enrollment automatic could prevent some from reaching their economic potential in terms of wealth accumulation. Recently after explaining the idea of automatic enrollment to my youngest son, I learned that some people don't like employers controlling their money and telling them what to do. My college-aged son, who's fiercely independent, was taken aback at the idea and wanted to be assured that an “opt out” was possible. He may want to save on his own, on terms not dictated by employer mandates. But my point here is not to argue the merits of automatic enrollment or disadvantages of employers acting on behalf of employees. 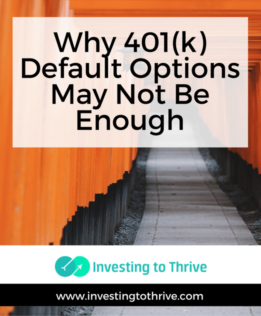 It's simply to mention that 401k default options may or may not be in the best interest of employees. So, it could make sense to look at all the choices and make a decision about what's best, independent of automatic selections.